The first-ever blockchain smartphone will finally debut this November with the arrival of Sirin Labs’ Finney — a feature-packed Android smartphone that its creators hope will become the ultimate blueprint for the first generation of consumer-ready, blockchain-powered devices. Announced last October and set to hit the market this November, the Finney is the brainchild of the team at Sirin Labs — the makers of the mega-expensive, ultra-secure Solarin smartphone. Fresh off an initial coin offering crowdsale (ICO) that drew in $157.8 million (well over its initial $100 million target), the Swiss firm is now finally ready to fully reveal its hand and show off the $999 Finney’s biggest secrets. 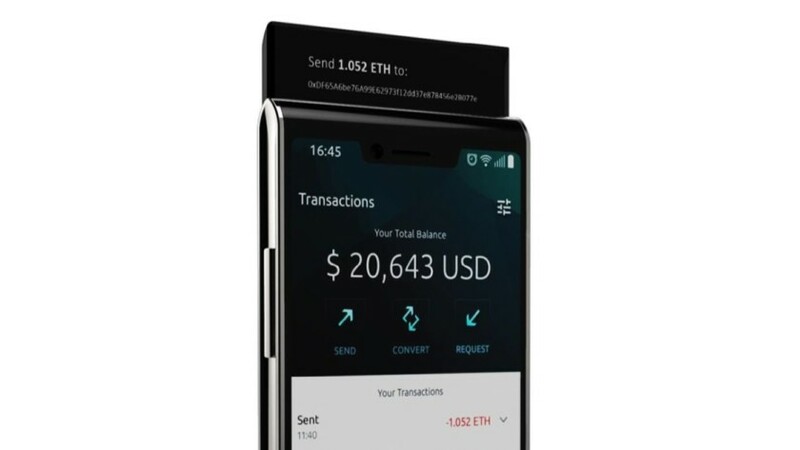 We’ve already seen the rise of phones with pop-up cameras with the Vivo Nex and the Oppo Find X, but with the Finney we have something else entirely: a slide-up second display powered by dedicated firmware that acts as a secure, cold storage wallet for cryptocurrency. This so-called “Safe Screen,” which only activates when slid-up manually from the device, is layered with PIN protection and is capable of independently verifying Finney wallet transactions to safeguard users from malware and hackers diverting their tokens to fraudulent parties. Aside from this multi-touch 2-inch OLED secondary display, Sirin Labs is promising that the Finney will rival other Android flagships within its price range both in terms of aesthetics, build quality, and raw power. The front and rear of the phone is built from 3D Gorilla Glass (grade to be confirmed), with a matte black finish on the rear, and held together by a concave metal frame embedded with two side-firing speakers either side. There’s no room for a traditional 3.5mm headphone jack, however. In a slight change from the concept we saw earlier this year, the display is now a 6-inch LCD, 18:9, Full HD+ panel (1080 x 2160 resolution) with a notched design and thin (but still noticeable) bezels. On the rear, meanwhile, the Finney sports a 12MP main camera with an f/1.8 aperture which sits on top of a fingerprint sensor (not in-display, as many, including ourselves, had previously speculated based on a prior spec sheet) in a similar shield-like style to that of the Solarin. Under the hood, the Finney packs a Qualcomm Snapdragon 845 SoC backed by 6GB of RAM, 128GB of internal storage (expandable), and a 3,280mAh battery that Sirin Labs claims can be recharged to 50 percent in 30 minutes, or refilled to max in two hours. The specs and second screen only tell half the story, however, and as we’ve already seen with the likes of Essential, it takes more than existing pedigree and a top-end spec sheet to capture a slice of the Android market. Not to mention the volatile cryptocurrency market which is estimated to boast over three million token holders. For the Finney, it seems likely that the “Safe Screen” will provide the hardware wow factor, but the heart of Sirin Labs’ ambition lies in its proprietary operating system, Sirin OS and its use of blockchain technology. Sirin describes its OS as an ultra-secure, Google-certified “fork” of Android, with the version on Finney based on Android 8.1 Oreo. While we’ve yet to see a working model (I’ve personally handled only a mock-up prototype), Sirin has confirmed that a familiar regular suite of Google apps will be available at launch, as well as the Google Play Store. The Play Store will be joined by Sirin’s multi-blockchain, community-run D-App store which will include decentralized apps that offer secure P2P resource-sharing between Finney phones. Sharing battery power and mobile data between users in exchange for tokens have been cited as examples, but Sirin claims there are many ways this could benefit phone owners. If you’re getting the feeling this is a niche product for crypto addicts only who know their bitcoins from their ethereums — a feeling that might be compounded by the fact that Sirin has its own currency too in SRN — then I don’t blame you. Sirin hopes to overcome this challenge, however, with its Token Conversion Service. While D-App store app developers are free to cater to whatever tokens they wish, Sirin says its OS is capable of automatically and seamlessly converting tokens to spend on the store, store in the cold storage wallet, or any other purpose without the need for an exchange. Considering how daunting the world of cryptocurrency can be, the conversion system could potentially help remove a lot of confusion for first-time investors. And it’s that last point that Sirin Labs sees as a huge opportunity. Co-CEO Zvika Landau recently told me the company expects to sell 100,000 Finney phones in the first year alone, and with more than 25,000 pre-orders already confirmed back in May, Landau is understandably confident that the company can hit those numbers with ease. In a way, though, the Finney is really just a proof-of-concept for its Sirin OS platform that it hopes will power the upcoming wave of blockchain-powered technology. Sirin Labs has made no secret of its plans to work with other OEMs in the future and intends to share everything from the Finney architecture, the SRN currency, and a fully open-source version of Sirin OS. In fact, back in March, Bloomberg reported that Huawei had entered talks with Sirin Labs over licensing Sirin OS for a potential Huawei blockchain phone. Sirin Labs refused to comment on the rumored deal but did hint that talks with unnamed OEMs are progressing. For all its promises and aspirations, there are a number of question marks hanging over the Finney phone and Sirin Labs’ plans. Shortly after the initial announcement of the Finney last year, Android Authority’s Scott Adam Gordon mused that the entire pitch sounded incredibly broad, and that concern still rings true almost a year later. Convincing a wider market that blockchain is the future of mobile would be an uphill battle for even the likes of Apple and Samsung, let alone a little-known, specialist firm from Western Europe — even if you’ve drafted in Barcelona FC superstar as your brand ambassador. And that’s all before you even get to the $999 price-tag, the out there, almost sci-fi-level concept of P2P resource sharing, the SRN currency (which at time of writing is worth less than 18 cents), and the Finney PC — a Sirin OS-powered blockchain ‘All-in-one’ system that Sirin’s chief marketing officer, Nimrod May, told me is scheduled for launch in 2019. In spite of all of these concerns, however, it’s hard to shake the feeling that all Sirin Labs — a small fish in a gigantic pond — needs to do is prove that its blockchain-based mobile ecosystem actually works to attract the eye of an industry killer whale. If the next major battleground for mobile technology is the blockchain, Sirin Labs will be hoping it can cement its place as the go-to arms dealer. We’ll be going hands-on with Sirin Labs’ Finney in the near future. For now, be sure to let us know your thoughts on the phone and Sirin Labs’ venture in the comments.